Imagine my surprise when I made the connection again for the first time in quite awhile in April 2013, and found…. … a brand new mezzanine…new floor, new lighting and new entrance doors. 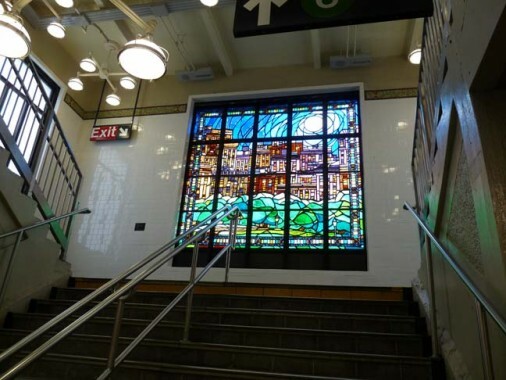 …new stained glass murals designed by artist William Low and executed by Erskin Mitchell Stained Glass in Baton Rouge, Louisiana, as well as new overhead lamps. Staircases have been augmented by glass blocks, which I have always admired. 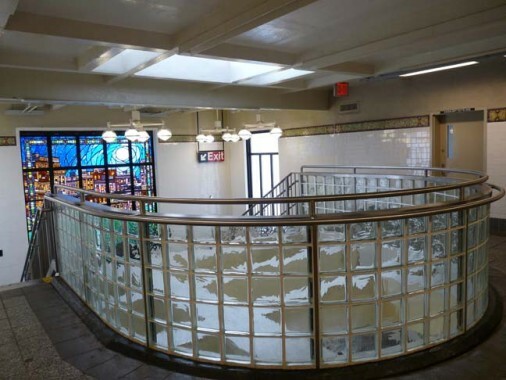 The original mosaic panels from when the station opened in 1920 (it was originally called the East 177th St station, as Parkchester was built in the 1940s) have been replaced by close replicas. 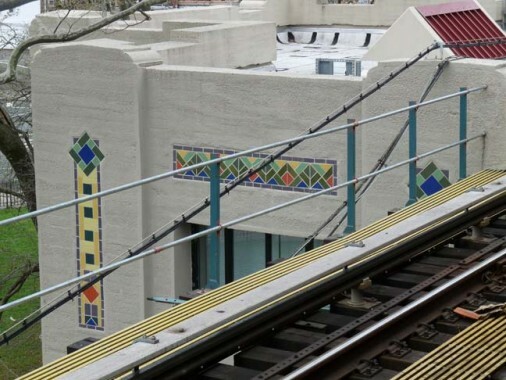 When built this station was considered to be an important one, as it was at the intersection of Westchester Avenue and East 177th (where the Cross Bronx Expressway is now) with White Plains Road nearby, hence it was given a thick concrete cladding, with exterior mosaics. 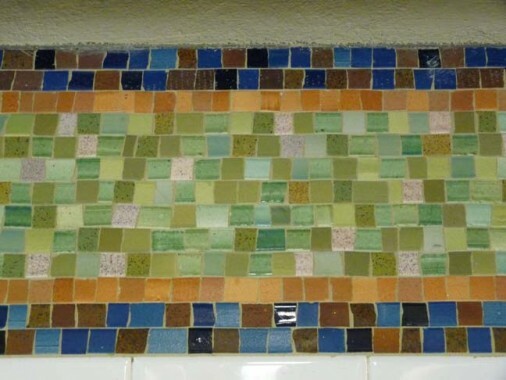 These were completely repointed and new mosaics installed. 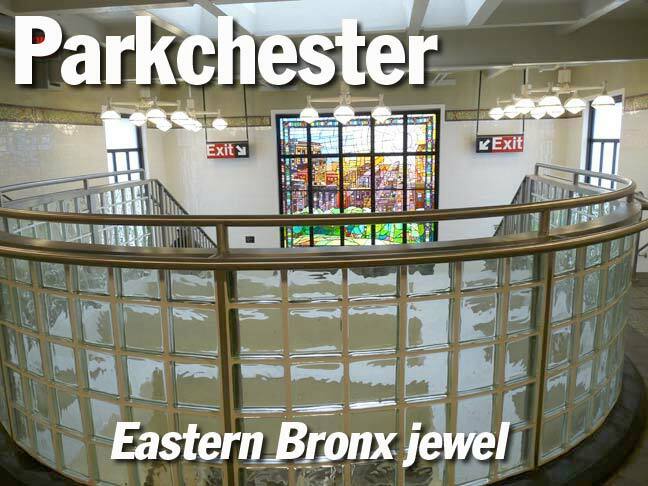 Since 1955 this station has stood directly above the rushing Cross-Bronx Expressway. Looks like I have been out of circulation a bit, and have some catchup to do. 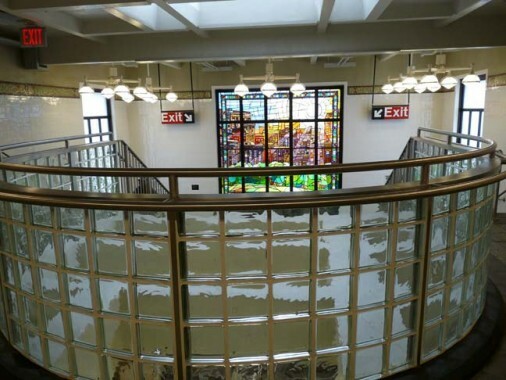 Next I plan to visit the newly refurbished East 180th Street station, featuring one of the largest station houses in the city. 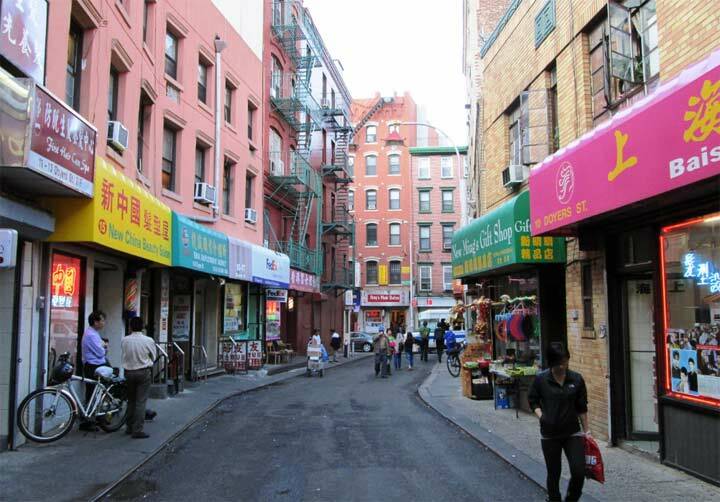 I was born & raised in Parkchester. I used the IRT 7 to get to James Monroe HS, 1964-67. I remember exploring one of the “lounges” & finding a cast iron coal burning pot-bellied stove. Obviously it was a holdover from a bygone era. In Mayor Lindsey’s “fun city” no one would consider waiting for a train such a dark isolated place even if the stove was in working order. I meant to say IRT 6. Sorry aout that. In the next phase of my life I moved to Flushing & used the IRT 7, 1972-78. 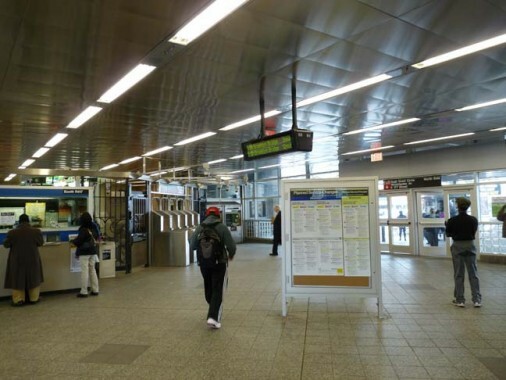 FYI The new South Ferry Terminal was destroyed by Sandy and the 100 year old loop station has been reopened. “Please stand clear of the moving platform”. 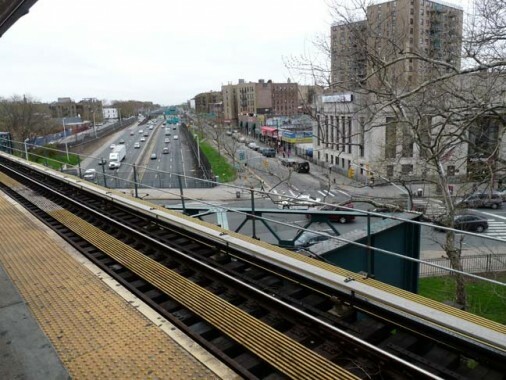 MTA says it will take 3 years to rebuild the new station/terminal. The new passage to the R Whitehall St. is open. Better ride in the first 4 cars if you want to exit 1/9 at South Ferry. Back to the future. First five cars, and there hasn’t been a “9” train in almost a decade, so I’m wondering when was the last time you were in New York?